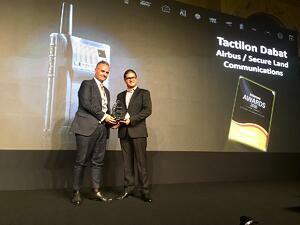 Elancourt/Dubai 22 September 2018 – Tactilon Dabat device, a secure Android smartphone and Tetra-Radio in one, has won the Intersec Award 2018 in the category “Innovative Security Product of the Year” in Dubai. The Security, Safety and Fire Protection Middle East Awards were held at the Habtoor Palace in Dubai on September 20th. They honour industry's best projects and products in the field of security in the Middle East. The Tactilon Dabat serves as the platform of a multitude of highly useful applications certified by Airbus. These applications can be arranged individually on the Dabat according to the wishes of user organisations. Thanks to the Airbus applications developer programme SmarTWISP, which was created to build an application ecosystem for the Tactilon Dabat, the number of new apps is increasing to offer a larg variety of innovative communication solutions. Secure Land Communications (SLC), an Airbus business unit, offers advanced communication and collaboration solutions to gather, process and deploy intelligence. Its portfolio is tailored to the needs of Public Safety, Defence and Transport, Utility and Industry (TUI). It includes infrastructures, devices, applications and services based on Tetra, Tetrapol and Broadband technologies (either single, hybrid or multi-technology solutions). As the European leader and a key international player, SLC has customers in more than 80 countries and employs around 1,150 people in 17 countries.